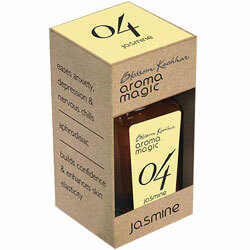 Buy Aromamagic Jasmine Oil for Depression, dry skin, exhaustion, labour pains, anxiety, sensitive skin. Eases Anxiety, Depression and Nerveous chills. Builds Confidence and enhances skin elasticity. Depression, dry skin, exhaustion, labour pains, sensitive skin. Jasmine Oil is Warm, floral, exotic. It is used for Nervous tension, depression, menstrual problems, laryngitis, anxiety, lethargy, as a relaxant. One of the most exquisite scents, said to be the king of oils. Especially good as a uterine tonic and or relieving all kinds of pain of the female reproductive system. Excellent anti-depressant, aphrodisiac and strong sensual stimulant.